Ah! Sweet mstery of smell, at last I’ve found thee! Perhaps the cat pissed on it. To wear with the stew of trash. It probably smells of moth-balls. When did you last wear it? Sorry old chum, but even if you cavort around in the open air with nothing on, you still stink. Try having a wash, for a change. So. The smell of the inevitable, the sound of immortality, and the sight of the invisible. When you have achieved these three thing Glasshoppel, you may reeve the academy. I know Ms Terial. Her first name is Emma. Smell of the inevitable? Somebody fated! @DnT I knew her sister, Emma Chisit. At least, that is what all the “johns” asked her. Manufactured in outer space, where there is no outside air. You could tell the cops its “hemp material” but they’re still going to search you. @Marum 0525: Sister? By a good friend of her mother, I presume. @DnT 0547. She had lotsa; “uncles”? @DnT How the other half lives. At the Townhouses I managed for 16 years, one “lady” had about 6 kids, all with different surnames. I assumed that she thought she was some sort of – mobile sperm bank. But I kept my opinions to myself. I found this strange, for in both my, and my wife’s family, for generations, everyone has stayed married forever. Only death has ever parted ’em. @Frank B. 0545. Did you know that Levi Strauss’ first jeans were reputed to have been made out of hemp cloth. As a material it is very durable. Just a thought on marriage. Some of my acquaintances have had many wives. They reckon that they are searching for the “perfect partner”. I really think, that one has to accept that one’s self is not perfect, therefore, why should your partner be. (perfect) Thus, logically, the “perfect partner” does not, and cannot, exist….How about compromise? One bloke I know, has had five or six wives. We call him: Mater Art Union. How remiss of me.I didn’t notice the brand. Which explains that mystrious smell, which cause your sinuses to smash into the top of your head. Under “FASHION MAN” I see the colours of the Italian Flag. Some reference to the a-Roma, maybe. If the smell is not greatly reduced after a few days’ airing, I’d say it’s a basked case. 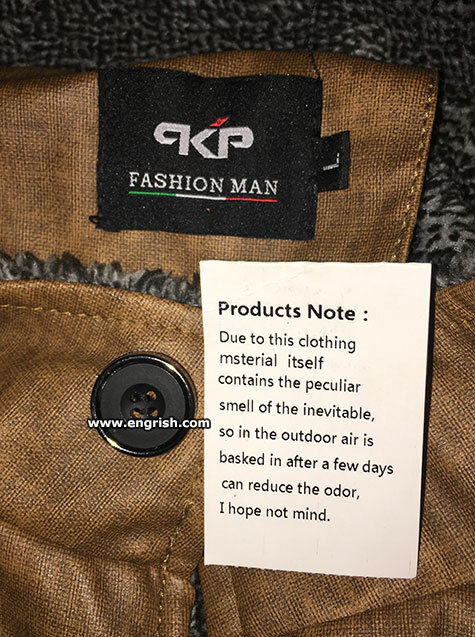 Our clothes have the arriverderchi aroma. For they who like the oldies. Some songs by El Dino. I stumbled across them while searching for the spelling of arriverderchi . Italian is not my forte. The language of superlatives; fortissimo, bravissimo, etc. That is the peculiar smell of inevitability. I hope not mind, Mr. Anderson. Could be worse. It could be the pervasive smell of the ineffable. Bask in the glory of our inevitably smelly clothes! I thought it should have been FASHION MSN – an oxymoron.